HOME | ELS TRAIN SERVICE — ELS Train Service LLC. ELS Train Service is dedicated to providing premium DCC and DCC Sound installations for our customers. We handle your engines with the utmost care to ensure none of the delicate components will be damaged. We will talk with you regarding your expectations from your DCC system. Our preferred sound decoders are ESU LoKsound and Soundtraxx Econami/tsu2. We will use any decoder that you, the customer prefers. We also re-motor and repair most brands of engines. Including replacing drives and gearboxes. We have a strong background in BRASS locomotives and are comfortable working on any and all manufactures of Brass. We typically install two speakers if the application allows. On Brass steam engines, we try to install the speakers in the boiler when ever possible. These are the two Climax engines that were painted, lettered and weathered by Jeff Lemke. I installed the DCC/Sound system and headlights. These engines are very rare and we wanted minimal modifications/alterations for the DCC system. The only modifications were the drilling of the holes for the headlight wires. I used a LokSound Select Micro decoder with a Full Throttle sound file. You will notice the intensity of the bark changes in the video. These engines only pick up power from two wheels per rail, so a ESU LokSound active power pack was installed between the motor and worm. These are much more compact than a traditional Keep Alive. Mounting the speaker in one of these engines is always a challenge. The best possible location was the roof of the cab. I selected five options and bench tested/compared them for sound quality. These included a 11x15 in a curved boiler enclosure, 18 x 13 in a 5 mm deep enclosure, Dual side by side 11 x 15 in a 5 mm enclosure, A modified Iphone 4S and an ESU 11 x 15 in a double wide enclosure. I was surprised that the ESU double wide offer MUCH better sound over the others. Black heat shrink fastened as conduit was used for routing the wires. This is a Brass Division Point Baldwin CenterCab. It has a ESU LoKsound Select decoder with a Baldwin 606 dual prime mover sound file. The prime mover sounds are adjusted to idle and run at slightly different RPMs. This gives the impression of the engines going in and out of phase. We used two speakers. This is a W&R 2-8-2. We installed DCC and sound. There are two speakers in the boiler along with a Keep Alive and the decoder. Cab details and lighting were installed. Smoke box flicker, headlight and tender lights were added utilizing LEDs. This is an Overland Brass NW5. It came with a poorly performing tank drive. We modified the frame and mounted P2K trucks. A can motor and LokSound DCC were added. We utilized a "Full Throttle" sound file. Notice the engine notching. A full cab interior with lighting was installed. Overland Brass SDL39 with cab detailing and lighting. I trust Dennis explicitly with all my high end steam locomotive work. He does a very impressive and competent job of installing sound and DCC. In addition, he is an expert in replacing gear boxes and upgrading motors. I am always kept in the communication loop on the details and schedule of the work. He carefully and comprehensively explains each step of the work and any options available. All shipments are packed extremely well to ensure safe arrival. I will continue to utilize his talents for all my future projects. "Dennis took my brass B36-7 and installed a Loksound decoder. Added additional pick ups to the trucks so that it has 8 wheel pick up. Finished the decals. Great job, runs great, sounds incredible. Highly recommend his work." "I have Dennis do all my engine work. I've had him do all types of work. He re-motors, paints, weathers and installs sound in my older brass steam and I have him install decoders in my diesels too. I've been using his services for the last couple years. I bring a few engines a month to him. If I ever have problems, he fixes them no questions asked." "Dennis is my GO TO guy when I can't figure out what's going on with my DCC stuff. I do all my own work, but when I get stuck, he can fix or figure out what's wrong instantly. It amazes me how much he knows about DCC." "I met Dennis at the Brass Expo this year. I had him work on three engines. An Overland SDL39, an Overland GP9m and a U25B. He installed ESU loksound FULL THROTTLE in all three. Added cab interiors with lights and crew as well as classification markers. Then speed matched them. They run and sound better than anything I've ever heard. The next engines are Milwaukee F6A and a Milwaukee K1. These two brass Milwaukee steam engines will get Paint, DCC, Sound, Lighting, the works. Highly recommend." 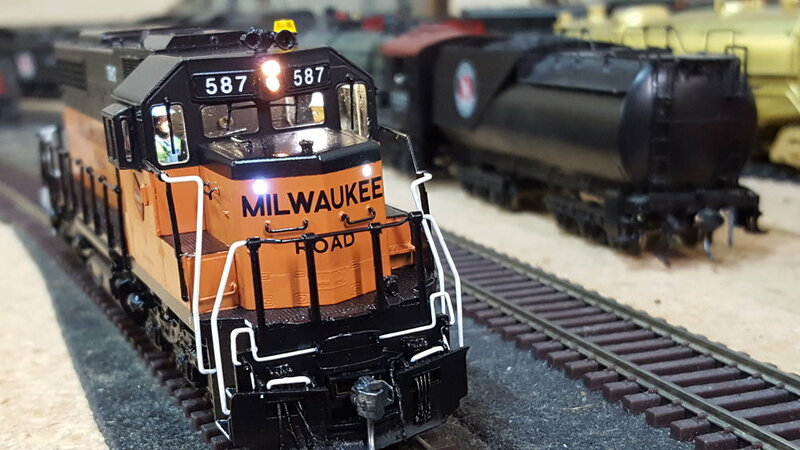 "I own the Soo Line Centercab that is featured in the video on the ELS Train Service website. Need I say more? Everyone is amazed at how great it performs and the absolutely phenomenal sound. I have had Dennis tune up more engines than I can count. He does all my DCC work and maintenance on my engines."